It has been said that the greatest spiritual imperative is to love. But how do we love with both strength and vulnerability, when to open our hearts to compassion is to also open our hearts to an awareness of the depth of suffering in the world? On Sunday, September 23rd – guest musician, international troubadour, and speaker Joe Jencks, will offer some ideas about how to love healing into being. Joe Jencks blends vivid songwriting with well-crafted instrumentals, and serves it all up with a voice that has the edgy richness of a good sea-salt caramel. 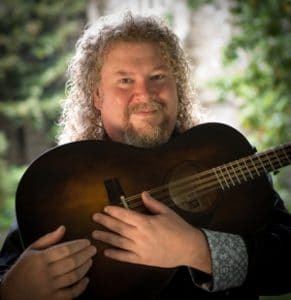 A 20-year veteran of the international Folk circuit, Jencks has penned several #1 songs in the Folk genre, including the ever–relevant “Lady of The Harbor.” Merging conservatory training with his Irish roots and working-class upbringing, Joe delivers engaged musical narratives filled with heart, soul, groove and grit. Jencks performs at concert halls, festivals, and spiritual communities throughout North America, and is known for his unique merging of musical beauty, social consciousness, and spiritual exploration. Recent releases include: The Forgotten and Poets, Philosophers, Workers, & Wanderers. Sunday Services at 9 & 11 a.m.
Not by Might, Not by Power, But by my Spirit.